This tour starts and ends in Härnösand, a small beautiful town situated on the coast about 450 kilometres north of Stockholm with good communications. Every day will present changing nature and beautiful views while you cycle about 30 - 40 kilometres a day. You stay in small B&B where you usually also have your dinner. Most of the tour is within the World Heritage "The High Coast". HÖGA KUSTEN (HOHE KÜSTE) wurde im Jahr 2000 von der UNESCO zum Weltnaturerbe erklärt. Hier gibt es die höchste Landhebung der Welt! Im Jahr 2005 wurde das Gebiet um Kvarken Schärengarten in Finnland erweitert. Beide Gebiete gründen Ihre Weltnatur erbe Status auf die Werte der Landhebung und bilden jetzt ein gemeinsames Weltnaturerbe. Das Meer an Höga Kusten ist ein Wert voller Lebensraum für Pflanzen und Tiere und deshalb eine Baltic Sea Protected Area. We offer a few days of varied and beautiful BIKING in the nature of South of Lappland. Each day holds changing nature and beautiful views. Go by bike on the small roads in the surroundings of Vilhelmina center- Every night same overnights in STUGMOTELLE, with cottages with 2-beds room with all facilities and even kitchenette for self cooking. Or in the center you will find lot of good restaurants, pizzerias a s o. In Vilhelmina you even have possibilities for fishing in VOJMÅN river and in several lakes. Doron (10 YEARS) was crying that he wanted to stay on this trip forever and not grow. I want to thank you again. The trip was amazing. It is difficult to express our appreciation for the amazing tour. We have never attended such an experience and probably will never do. We thank your hospitality and admire guidance, knowledge and ability. The week in the nature was a striking experience. I have never imagined doing these rides. Hope to see you next year. We plan to arrive for winter tour. This offer is with accommodation all nights at STUGMOTELLET VILHELMINA. For overnights in different accommodations Offer on request. By your bike you make a tour 35 km to a little village LILLA ANNEVARE. Evening tour about 3 hrs in an unique Wilderness Area EURO 88.- per person. 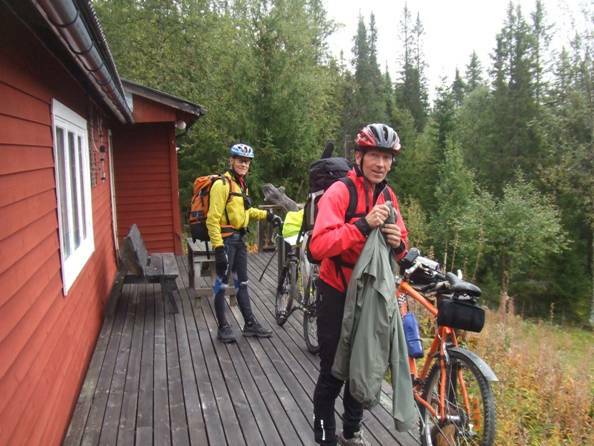 After the safari you go back by bike (35 km) during the night to your accommodation in Vilhelmina. And remember we have the daylight even during the night! Do you want transfer by car you can order it at site. BEAVERSAFARI WITH OVERNIGHT STAY IN A “KÅTA” – the traditional tent of the Sàmi (Lapp) people. 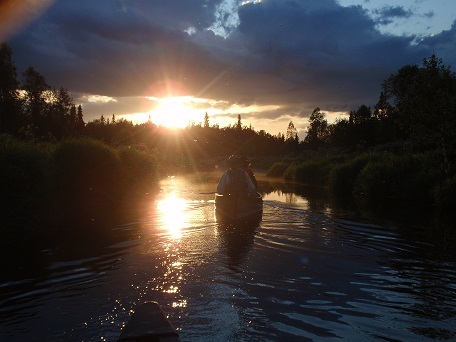 Beaver safari, wilderness dinner by the fire and to stay overnight in a kåta is a special experience. In the middle there is a fire place called Árran in Sami. Opposite the door you find “Boassjo”, the kitchen. You will sleep in sleeping bags on reindeer pelts and fine branches of birch during the unforgettable night. Time start at 16.00 p.m the first day until 10.00 a.m the next day. It means going by bike about 35 km in the morning and coming back next afternoon. Other activities at LILLA ANNEVARE are BIRDWATCHING, A tour up on the mountain STOR ANNEVARE, TOUR BY HORSE AND WAGON. During your stay in VILHELMINA we suggest you to go with our host into LAPPLAND AREA MOUNTAINS for a day tour incl. transfer for a bike tour among the beautiful mountain area. Price on request. Price includes TRANSFER FROM VILHELMINA AIRPORT OR VILHELMINA RAILWAYSTATION AT INLANDSBANAN RAILWAY.